I continue to tell other Right leaning fiscal conservatives that as much as they continue to support a Republican Party that says one thing, but then does the opposite once in office, they are supporting the wrong party. They scoff. Fair enough. As long as they consider FoxNews a legitimate news source there won't be much opportunity to show them the truth. But there is a Graphic that has been flying around Facebook for several days now. Take a look at the Left. And for added reading, Bloomberg goes into some details. House Speaker John Boehner often attacks the spendthrift ways of Washington. 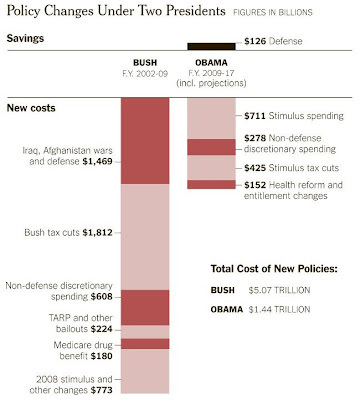 Yet the speaker, House Majority Leader Eric Cantor, House Budget Chairman Paul Ryan and Senate Minority Leader Mitch McConnell all voted for major drivers of the nation’s debt during the past decade: Wars in Afghanistan and Iraq, the 2001 and 2003 Bush tax cuts and Medicare prescription drug benefits. They also voted for the Troubled Asset Relief Program, or TARP, that rescued financial institutions and the auto industry. Together, according to data compiled by Bloomberg News, these initiatives added $3.4 trillion to the nation’s accumulated debt and to its current annual budget deficit of $1.5 trillion. You should read the rest. Next to 'The Fix', Cagle's blog with his assortment of Editorial cartoons should be a regular stop, and his collection of columns can be a must read. 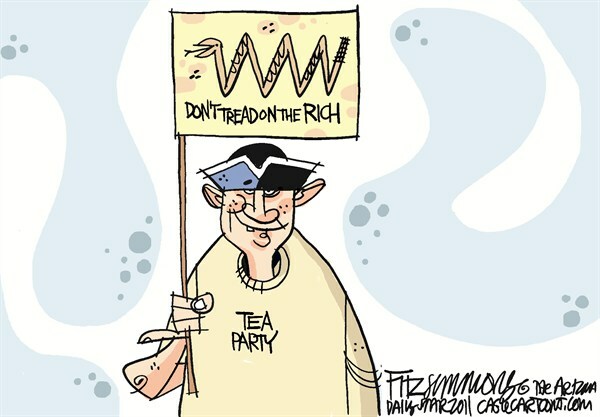 Based on Tax Foundation figures, the richest 1 percent has TRIPLED its share of America’s income over the past 30 years. Much of the gain came from tax cuts and minimally taxed financial instruments. If their income had increased only at the pace of American productivity (80 percent), they would be taking about a TRILLION DOLLARS LESS out of our economy. In what way do the richest 1 percent deserve these extraordinary gains? Care to take a stab at it. If we were experiencing the boom we were led to believe would happen under these policies, they may be justifiable. But in reality, and as predicted by many of us, this only took money out of the economy, stalling it, and creating a catalyst for economic tumult. As mentioned below, my post on January 25th is as timely today as it was then. 6 Months ago, we could have implemented my plan and we would not be facing inevitable economic tumult. Now we have no choice but to increase the borrowing power of the Fed to keep our country solvent. 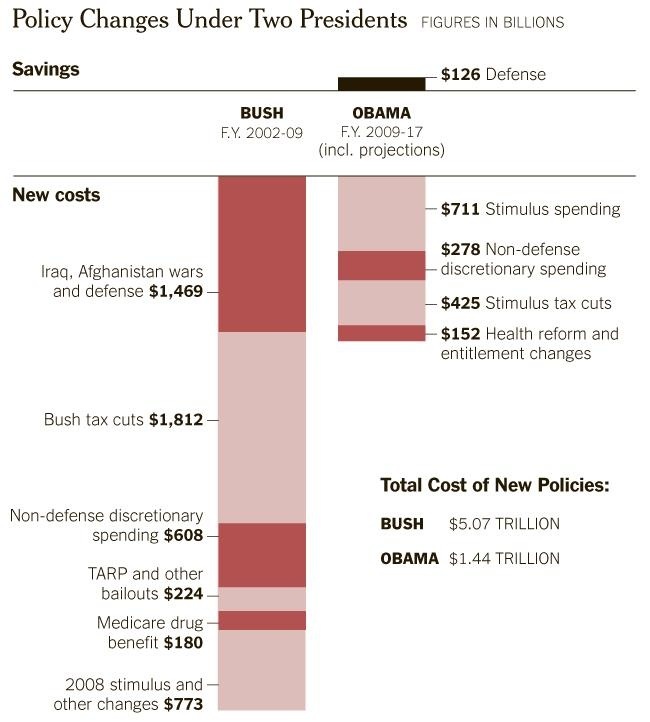 However, for those of you not paying attention, the Right has never been concerned about the solvency of this nation or deep spending cuts for that matter. It has always been a political ballot box game to them regardless of the cost. We lived a microcosm of this during the MN State Government shutdown and when the Governor called their bluff, they got cold feet, initially. They had no choice but to own an offer they thought the Governor would never accept. I suspect something similar will happen in the next day or two. The President will agree to a smaller, shorter term offer as long as it extends past Nov 2012. I mean, we wouldn't want to go through this same process just before an election, that would be . . . what . . . putting personal political partisanship over the best interest of the country. No one would do that, would they? So, I stopped writing on January 25th, and ironically, that post is as timely today as it was then. More on that in the next screed. Things have been going great, lately, so just a quick update. Airman Nick is currently stationed at Tinker Air Force Base in Oklahoma City. He just completed Combat Readiness School and may deploy soon. He called the other day to say he probably won't get away on leave before then, so we'll have to rely on occasional phone calls and Facebook chat to stay in touch. He continues to be confident in his choices and grounded in his future. I am so proud of that young man. I am having an incredible time performing with Minnesota Brass, Incorporated, my 20th year on the field as a marching member. This is by far and away the most challenging book we have ever performed. This years' program in entitled VALHALLA! and takes our Viking hero, John, from immigration across the sea (Immigrant Song, Led Zeppelin) to our prayer/battle sequence (Mingus Children Hour of Dreams) where our hero dies in battle. From there we bury him at sea to our ballad of John Lennon's Imagine. And, of course, all Vikings who die an honorable death in battle are delivered to Valhalla with a ride from the Valkyries, which means Wagner's classic for the closer. Embedded below is our performance at TCF Bank stadium to give you a peek at us mid season. This weekend we head out to Lewisburg PA to go head to head with out main competition. Labor Day weekend is World Championships in Rochester NY. I may not get into full daily posting mode, but I do plan on putting something out there a few times a week. Someone has to inject common sense in the midst of all the partisan gamesmanship! Irregardless, it's GREAT to be back! !